I noticed it has been exactly one year ago that I posted last to my blog. 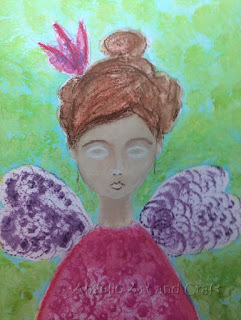 Since opening my facebook page: angelicartandcraft, I have been neglecting my blog. I found it easier and quicker to create a post on my facebook page compared to writing on the blog. 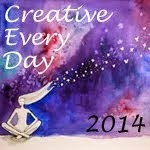 I started my blog originally with the intention to keep a chronological diary of my creations. 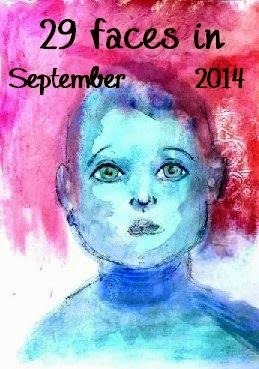 I tend to work on different projects and in different art journals over time, and I also don't always date my work. So I thought this is a good way to see what I have been up to over the course of a year. I have a love/hate relationships with social media. I love the interaction and inspiration I get from seeing the artwork of other artists. But I also find myself being sucked into a social media vortex where I can end up just looking and admiring other peoples art without getting any art done myself at all. It was meant to inspire me, not stop me from creating art. But we only have so much time in a day. We need to choose wisely how we want to spend our time. It is hard to find an even balance between making time to create and spending time online sharing what you have made or admiring creations of others. This is one reason why I stopped posting on my blog. I found it was very time consuming. Time I rather spend making art. Why am I called today to post on my blog? People keep telling me to not just hide in my closet making art, but they love to see it and have told me that I should keep sharing what I make. 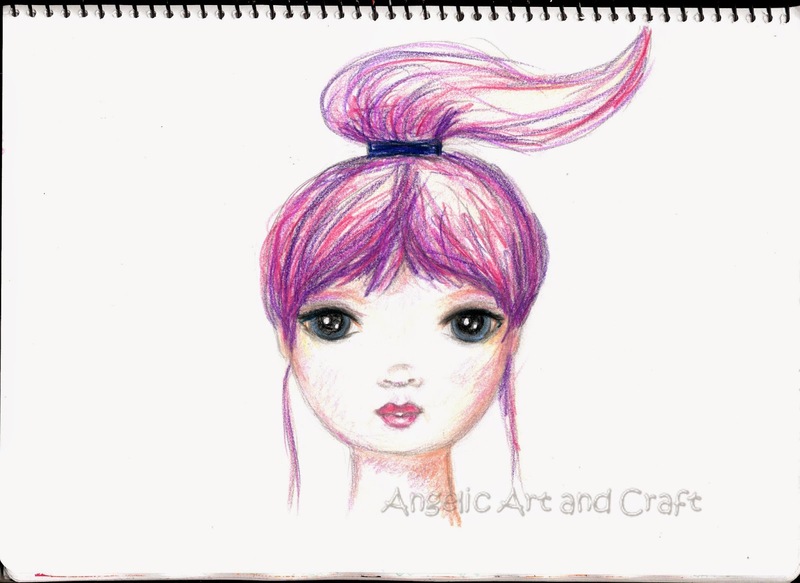 I like to share the stages of my latest art angel I created, after I had another creative break. I tend to have creative breaks, when the rest of my life commitments consume most of my time. When I created this art angel on the weekend, it went through several phases. Phases of what felt to me like the ugly stages. Not sure if I still had it in me to create a face. When I have not drawn for a while I can feel that my creative muscle needs attending to again. It is like I loose the momentum each time I have a creative break, and need to start all over again learning how to draw a face. I expected it was like riding a bike. Once you know how to do it, you just get on your bike and ride again. But to me it feels more like going to the gym. Every time you have a break of any type of fitness regime, you need to re-train yourself again to get up to that same level of fitness that you were before you took the break. I took photos at several intervals of the creation. My art went through stages that I was not happy with, but I kept persisting and I am glad I did. I am very happy with the final result. 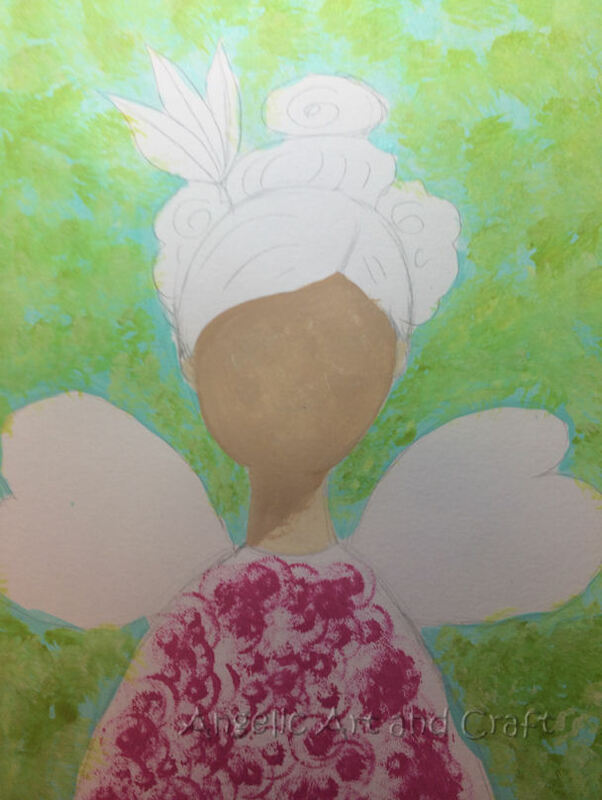 I thought the blog would be the best place to share the making of this angel as I can post the photo's in order that I created the angel, which is a bit harder to do on the facebook page. 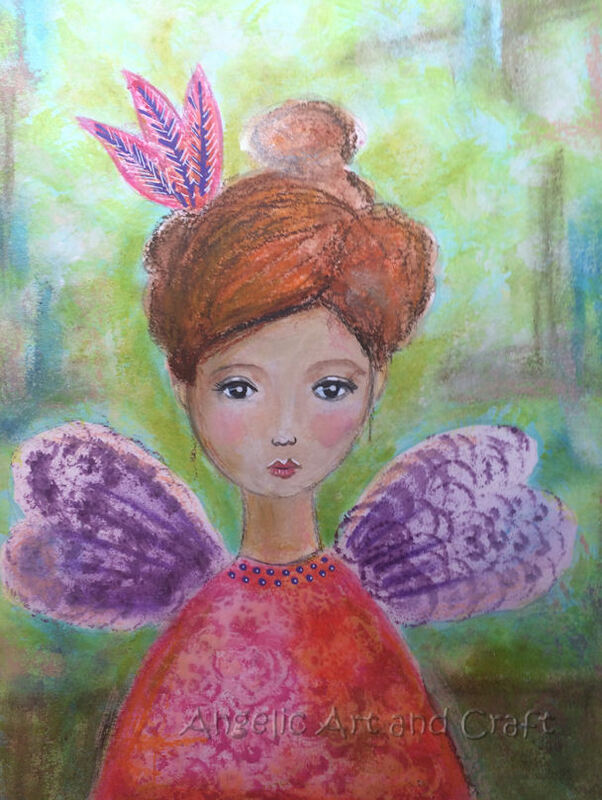 I am waiting in anticipation for the new online class of Kelly Rae Roberts to start in early October called: Spirit Wings. I have been a big fan of Kelly Rae Roberts art for a while now. 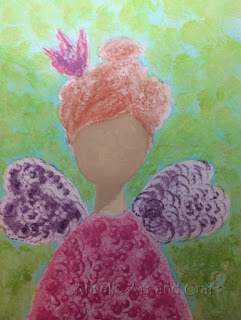 It all started when I was gifted a Kelly Rae Roberts ornamental angel. It was more then a year after receiving this gift that one day I decided to type KRR into google and found her website. Here I then found she had written a book, called: 'Taking flight'. I ordered the book and then it still took another few months before I actually read it from start to finish. 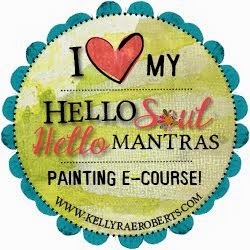 Whilst I was reading the book on holidays around the same time Kelly released her online class: 'hello soul, hello mixed media mantras'. Once again I felt called to sign up for this class. In my last post (15 Sept 2014) I shared some of the backgrounds that I created a year ago at the start of this online class. I hope that reading and viewing this post may be a form of inspiration to anyone. 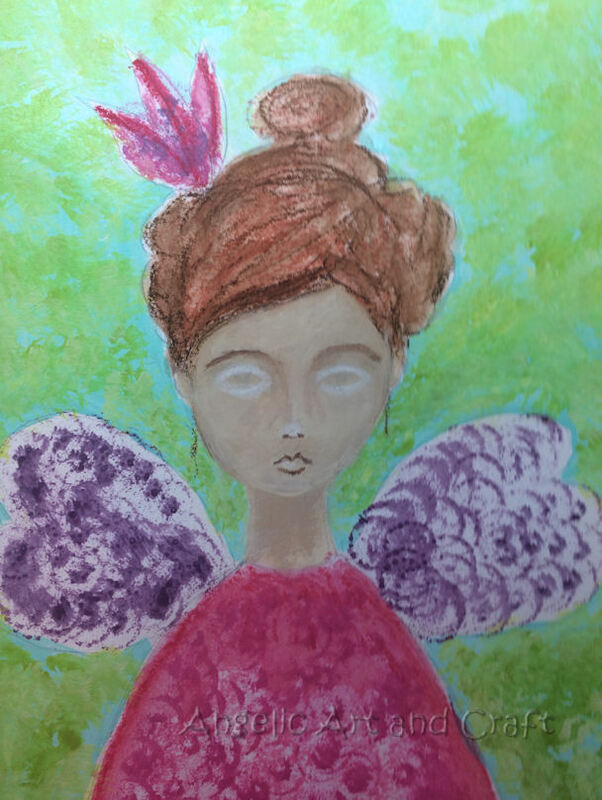 I love creating art as it allows me to relax and forget momentarily about any other life commitments or concerns. Whilst creating it gives me the feeling that time does not exist. 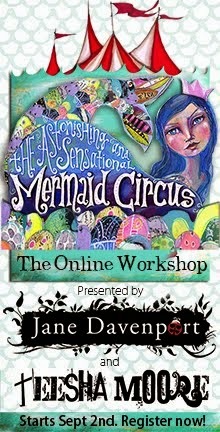 I have joined the Mermaid Circus with Jane Davenport and Teesha Moore. We are making a shaped journal and using collage in the creation of our Mermaid. 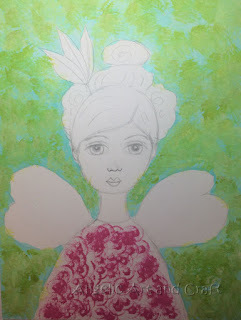 At first I found it very challenging to work within an already outlined area. I was also not comfortable with using collage in my art work at first. I have only ever used collage in creating backgrounds, but not in the subject itself. But I persisted with the creation of this project with an open mind. Whilst creating my mermaid I started to enjoy the process more and more. 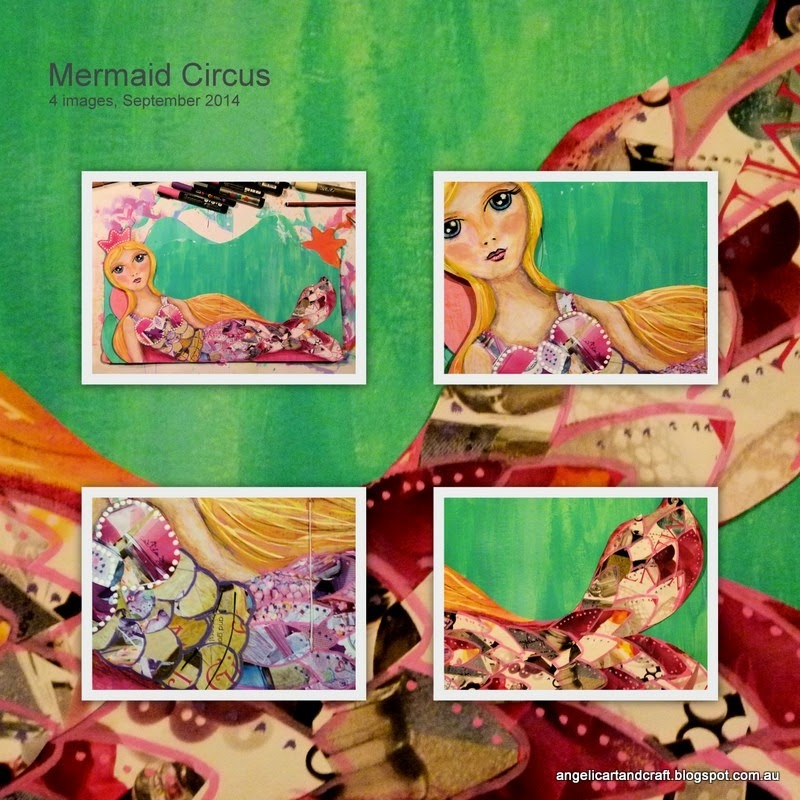 In the end I was very pleased with the effect of the collage pieces to create the scales for the mermaid. I really like the effect it has. I will definitely incorporate collage into any of my future art creations again. It also taught me that it is great to try new things and challenge yourself to create in ways that you do not feel comfortable with. If you keep an open mind and just go with the process one step at a time and just enjoy the process rather then expecting a result, the whole experience can be quite rewarding in the end. Having an intention before you set out to create, is a great way to remind yourself during that session, what it is you set out to achieve. Some days you might just like to play and be curious like a child. Other days you might like to learn a specific technique. 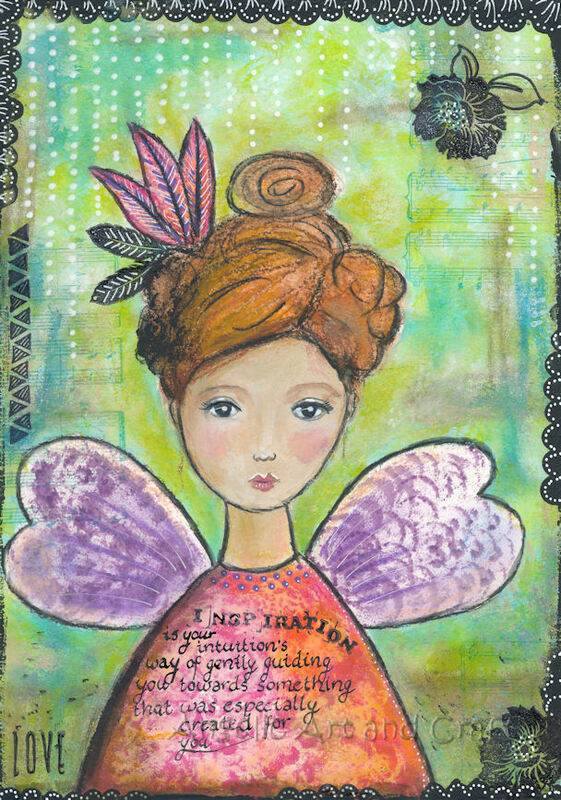 It is great to mix things up a bit and have different intentions on different days. 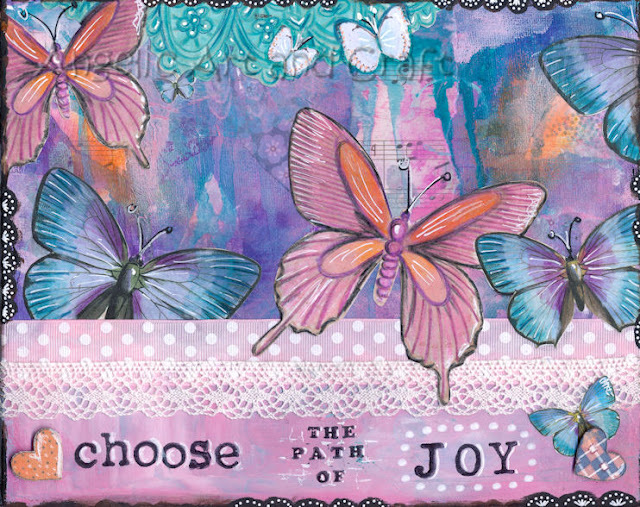 As each will bring your forward to your next step in creating art and exploring the possibilities that are available to us. I am a bit behind with creating a face every day for 29 days. 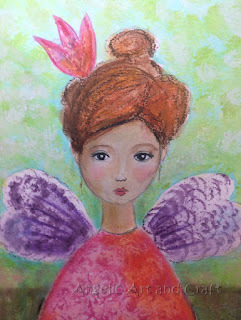 I find it quite tricky to keep up with any challenges that involves creating something every day for consecutive days. I try to get in my art room most days and do at least something small towards a project that I am working on. I often have many projects going at the same time. As a result I don't always finish everything I am working on. Sometimes it can stay half done for ages. But at the end of the day I guess that does not matter. As long as we are busy making something that inspires us on a regular basis to give us joy. Here are first 3 faces I sketched in my sketching journal with pencil. I like to sketch faces to practice different face shapes and hair styles. 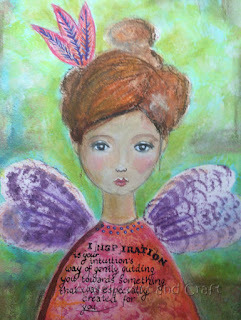 For the following art journal page I created, I was inspired by the Art Journal & Tutorial videos by Iris Impressions. The particular video that inspired me for this page is called: 'She did her best'. 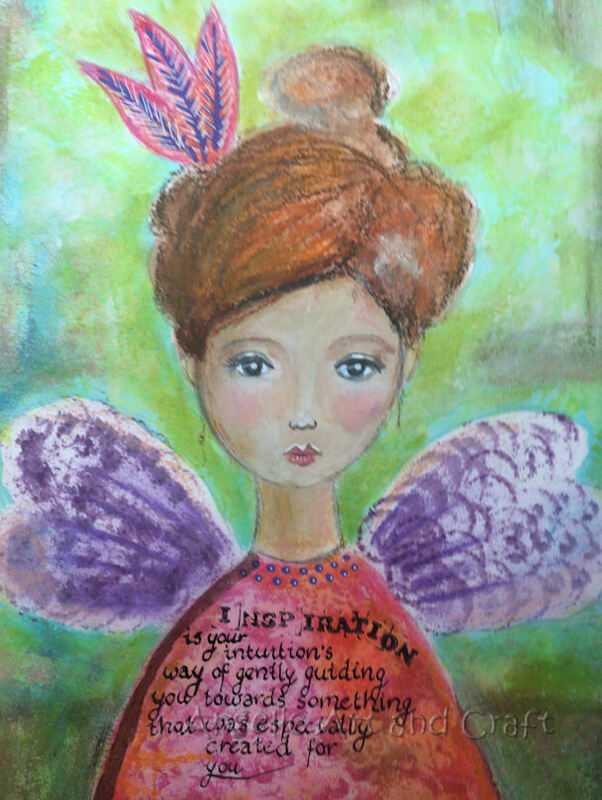 and many more great inspirational videos created by Iris. Today she has posted another great tutorial on her YouTube channel called: Access your Joy. 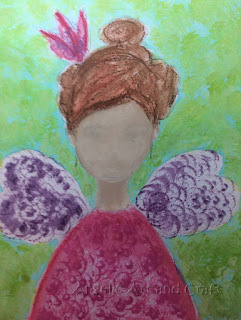 For face 3, I decided to use water soluble oil pastels. I continued to work large on the A3 printer paper as I did for face 1 and 2. I am more used to working with coloured pencils, which have a nice fine point. 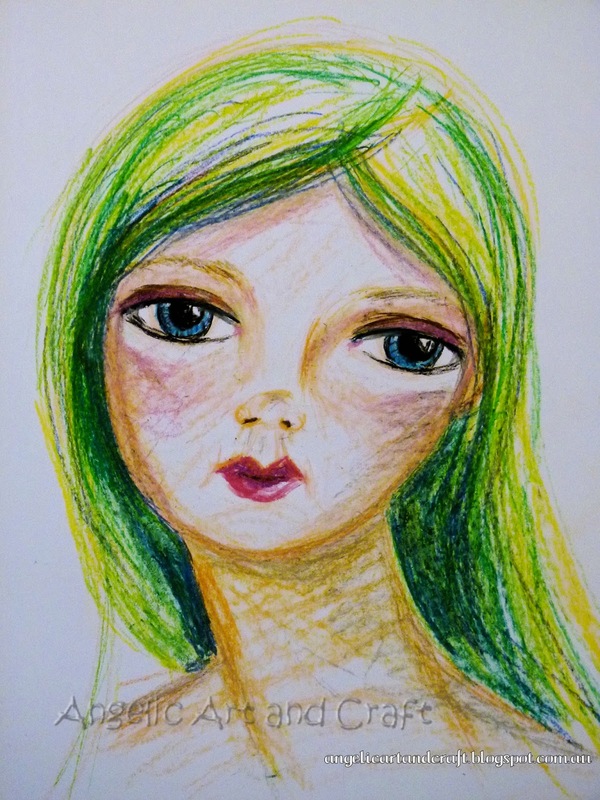 So working with these oil pastels was quite a challenge for me. I am glad I was working on a big piece of paper as it would be impossible to draw any fine detail with crayons. The other challenge I found working with this medium was that I could not rub out any mistakes. Any lines down on the paper were final. 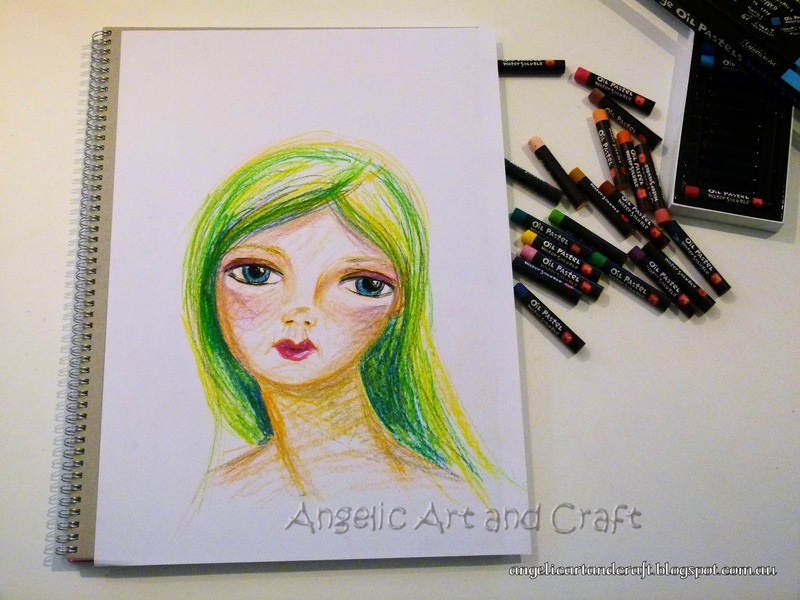 With these oil pastels I also could not smooth and blend the colours with my fingers, as you can with charcoal, graphite or soft pastels. I did not use water with these water soluble oil pastels because the paper would not allow for it. I would need to try that on water colour paper. Once again I enjoyed working large and drawing with crayons gave me the feeling I was drawing like a child. Just putting down lines and colour without being too concerned about any perfections. 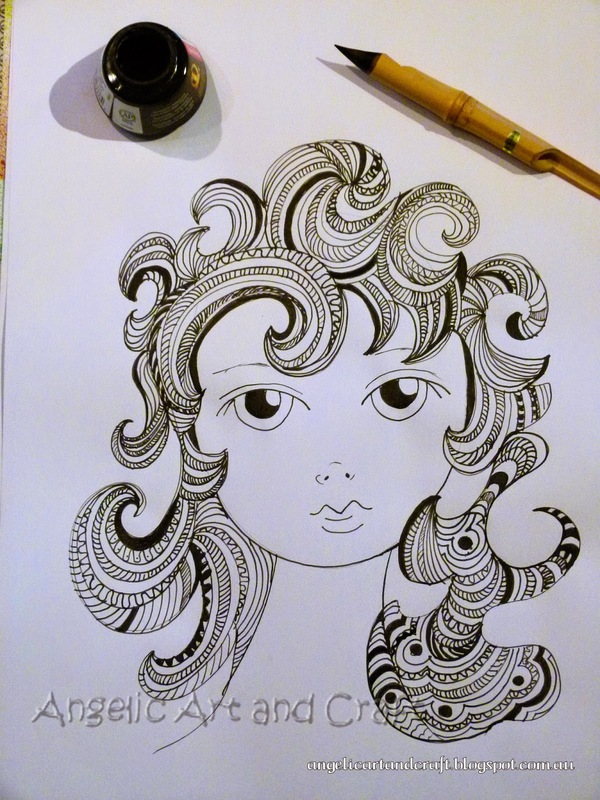 For face 4 I used black india ink, drawing with a bamboo dip pen. Again, I used the A3 printer paper because I enjoy working large at the moment. 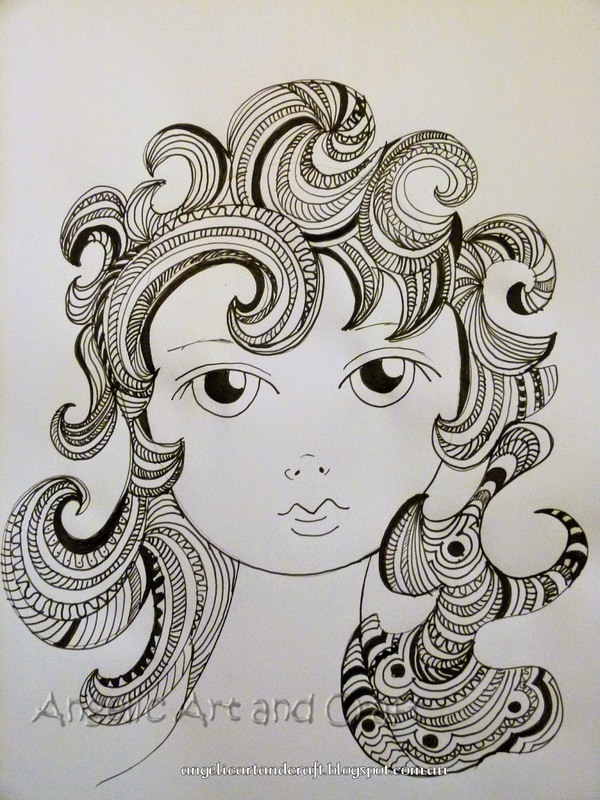 Creating the zen-tangle style hair was very relaxing. Thank you, for your visit! 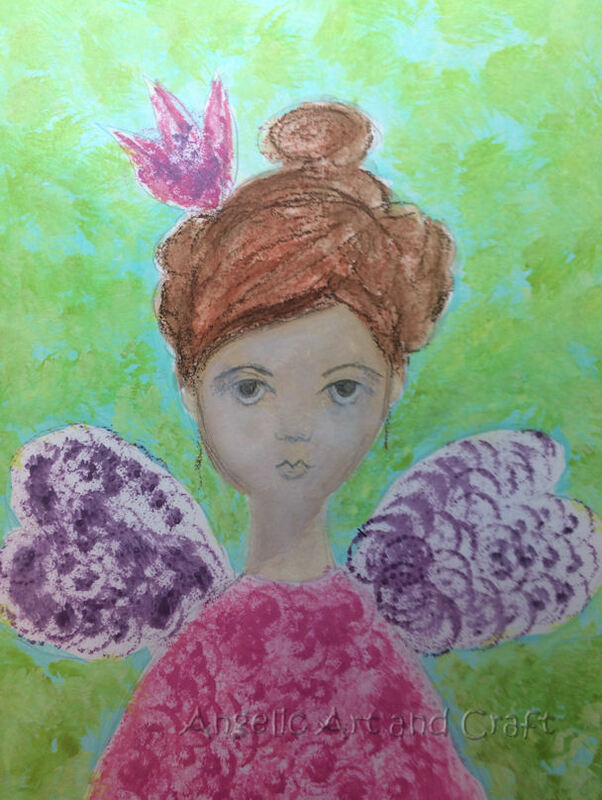 I have decided to participate in the 29 faces challenge created by Ayala Art. 29 faces was originally created in a leap year to celebrate the year with art. 29 faces in 29 days in February. It's all about a FACE. 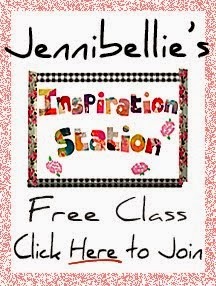 The idea is to gather up all your art supplies and to try something new to YOU! 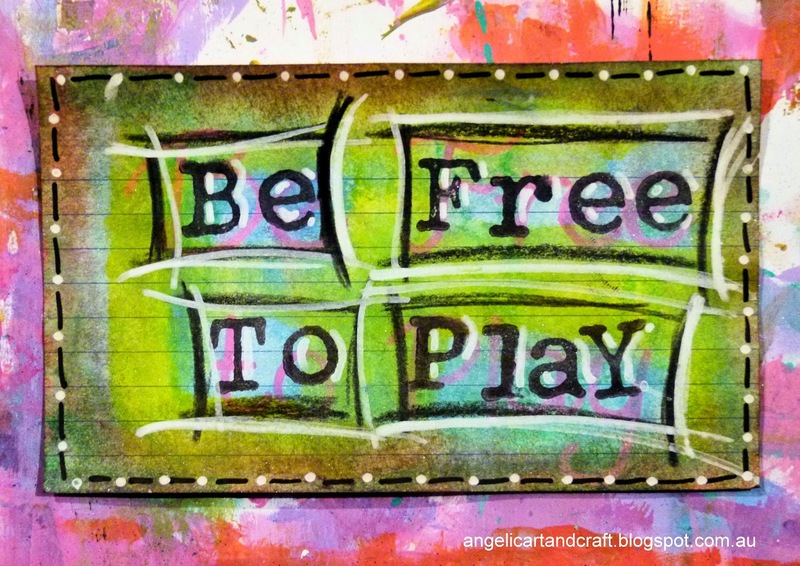 It is time to play and not be afraid. To be ready to mess up, fix up, practice and have a huge amount of fun while doing ART. I am not sure if I will be able to keep up with this commitment every day for 29 days, but I give it a try. The only way I have any chance to create 29 faces in 29 days is to create a face quickly in not too much time. Generally when I draw a face I can easily spend a long time on it. So my challenge is to create a face in a limited amount of time as well as using mediums, methods and elements I normally would not use a lot. 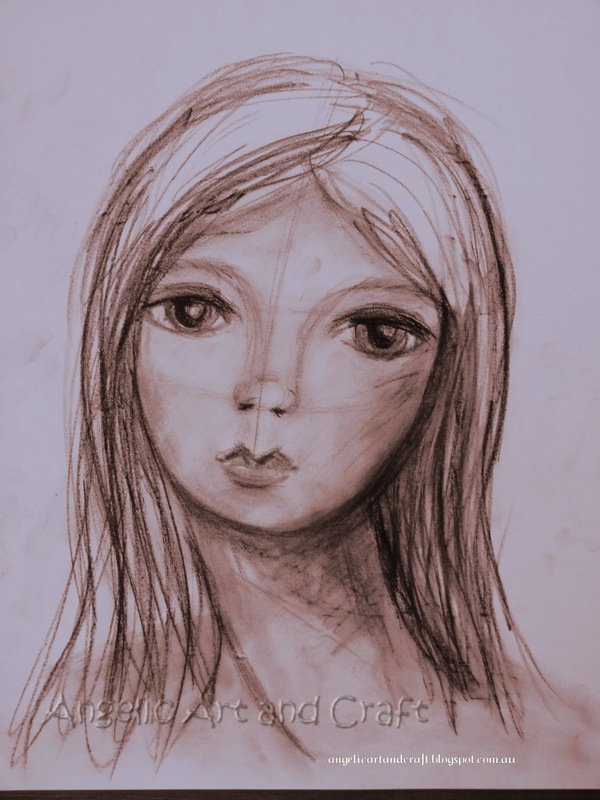 Through my blog posts I will share with you the faces I have created and the challenges I have faced using different methods and mediums and what I have learned from each experience whilst creating a face. 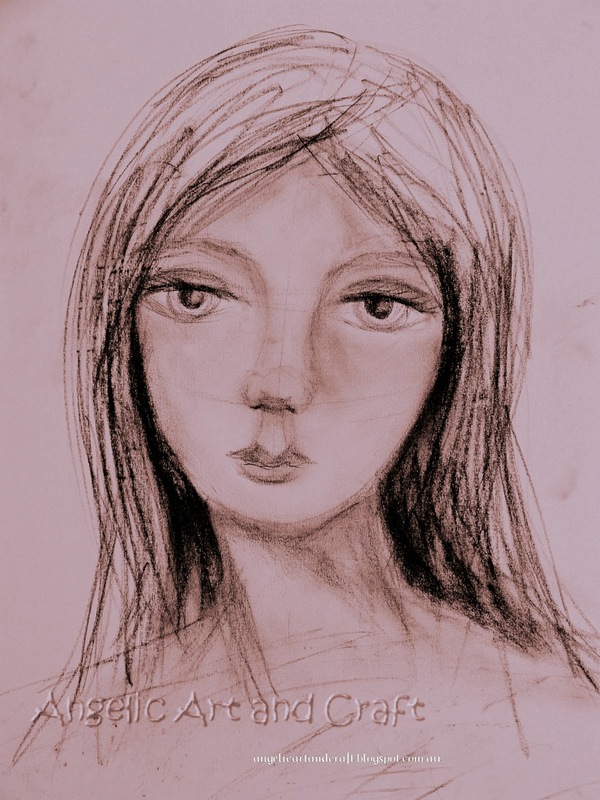 One of my first faces I ever drew that I was really proud of, is when I was a teenager and created a face with charcoal. 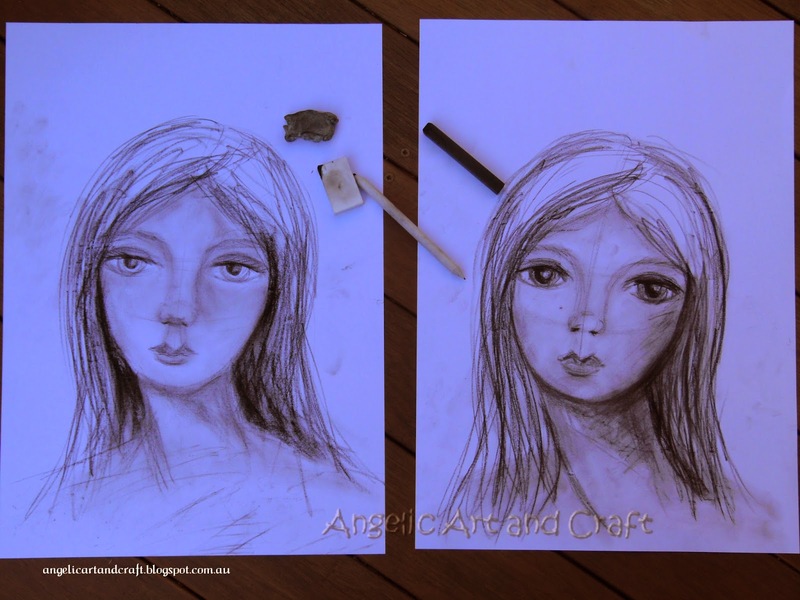 I have not used charcoal for years. So I went looking around my supplies to see if I could find some. I could not find my original charcoal I had as a teenager, but I found a packet with charcoal pencils, charcoal sticks, a blending stump, and 2 different type of rubbers. First I had a go at sharpening the charcoal pencils. But I was not successful. Every time the point would break. So I decided to just use the charcoal sticks only, to draw with. I got out an A3 piece of printer paper. So nice cheap paper and cheap art supplies (little packet was from a thrift shop - probably explains the breakage of the charcoal pencil). I drew this without any reference to look at. Just a quick sketch to loosen up. I enjoyed drawing on a larger scale as I would usually (A4 or A5). Drawing on A3 with a large stick of charcoal gave me a nice free feeling. I loved just sketching without any expectations. 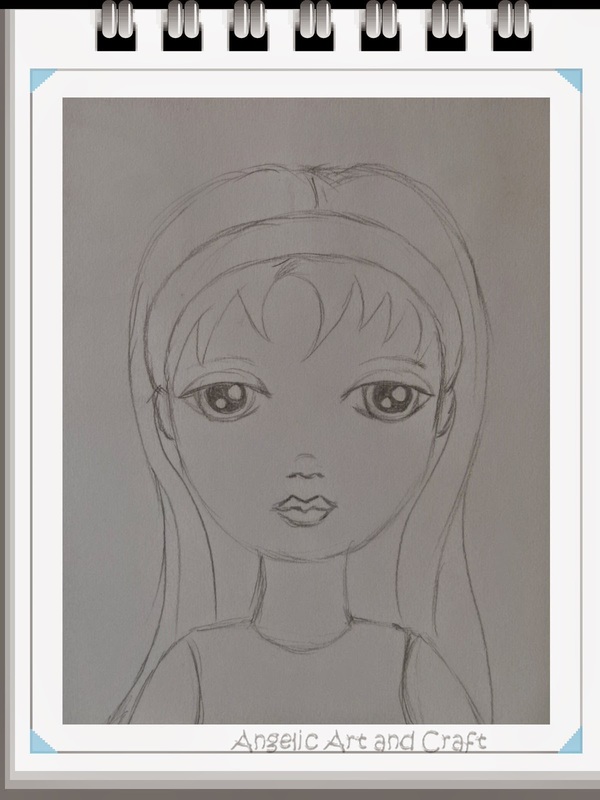 Using the A3 paper allowed me to draw a larger face as I would normally draw and I experienced that because of this I was now drawing more from the shoulder instead of my hand. I will definitely start drawing larger on A3 paper more often from now onwards. I managed to draw this face in approximately 15-20 minutes. I used the same art supplies and A3 printer paper. I feel working large is a great way to loosen up and leave my tendency of wanting to create in detail behind. I am looking forward to see what else I will learn on the way creating 29 faces. If you are participating in this challenge as well. Please leave a comment and let me know what you are discovering on the way. 'Draw Happy' and 'Supplies Me'. 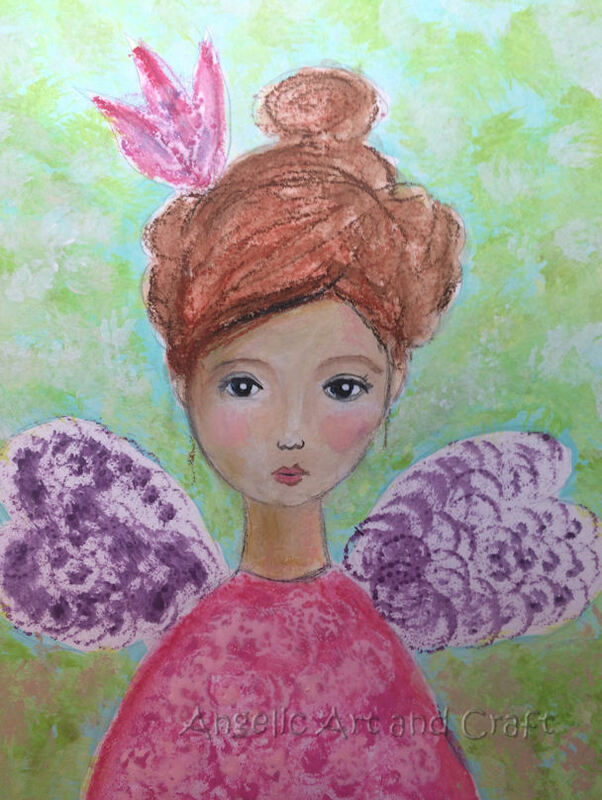 'Draw Happy' is a great course for beginners and 'Supplies Me' is a great follow up where you learn about all the different art materials and how to use them. 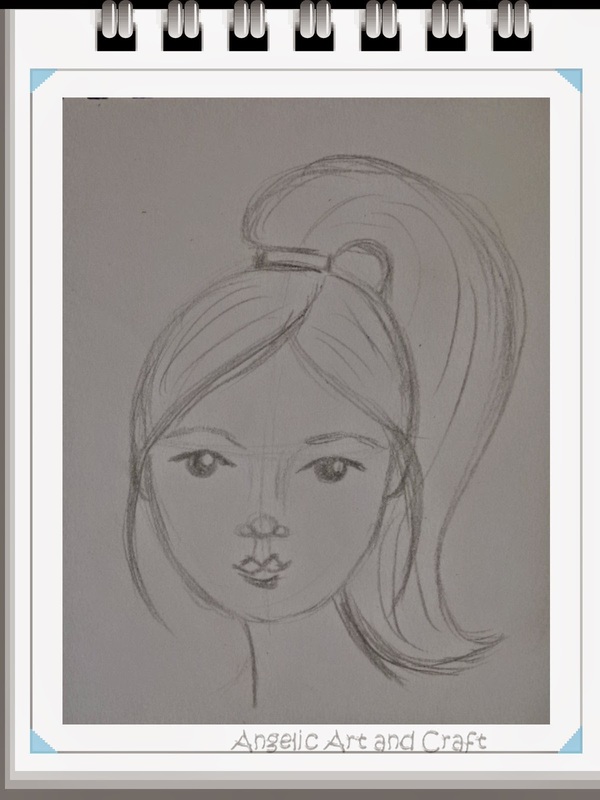 Through her courses she explains very well how to draw faces. This is how I fell in love with drawing faces. Especially whimsical faces. I also really enjoyed her video: 'The whimsical face' filmed with Cloth Paper Scissors. 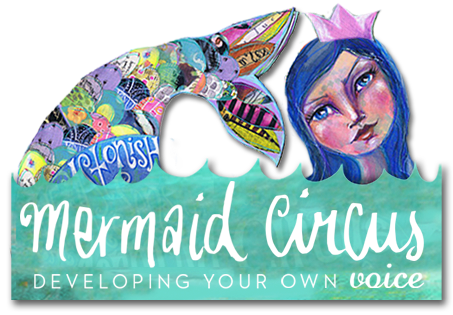 Her workshop Mermaid Circus opens 8 September, created with Teesha Moore. 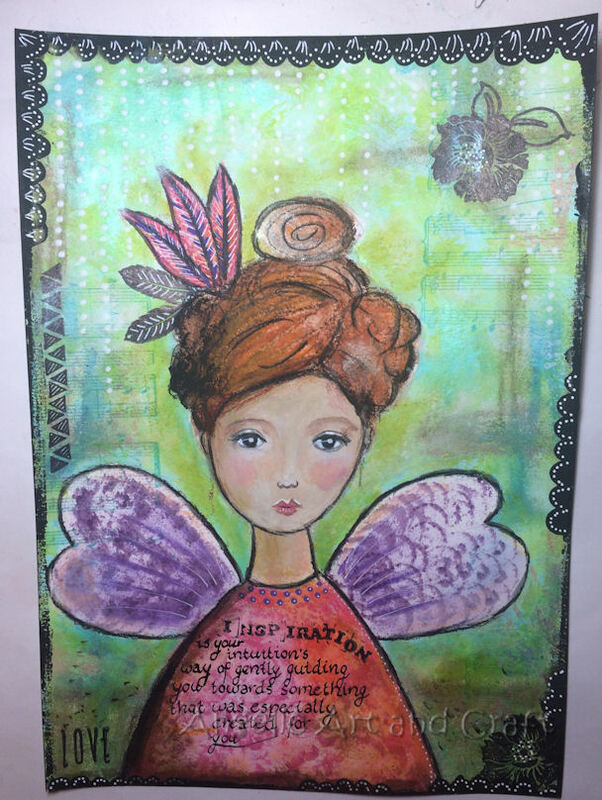 If you like to find out what this course is about and also like to enter in her give away to win an entry to the course, head on over to her website here. I would love to win an entry to this course. Having done some of her courses previously I can highly recommend them. They are a lot of fun. Good luck to all who enter. Reach for the stars and colour your world. The above image has been especially created for the 'artsy blog hop around the world’ by Minerva Levinston, who invited me to participate. 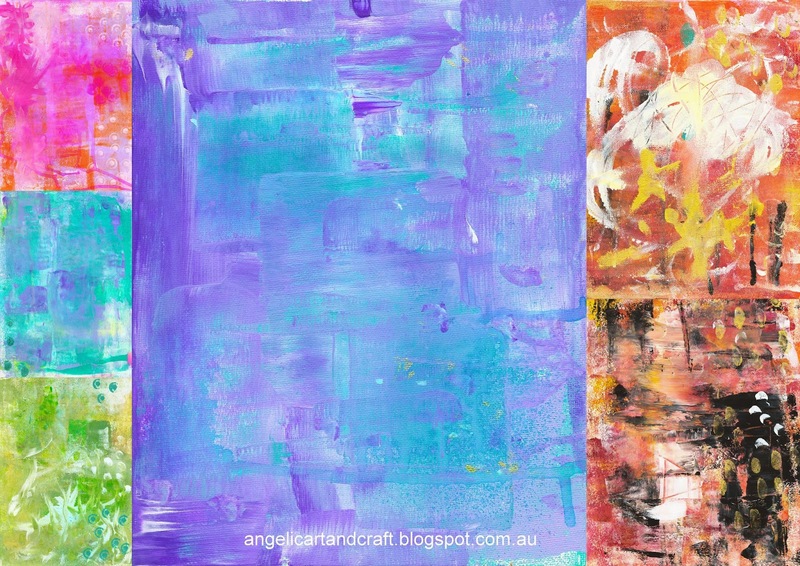 What is an artsy blog hop? You are invited by an artist from another blog to participate. You then post your answers on your own blog on a nominated date and then invite other artists to participate and link to their blog, where they will post their answers on their blog a week later, and so on. Last week I posted my answers on my blog here. The week before Minerva posted her answers on her blog here. Iris and Denise both come from Dutch speaking heritage, just like me. Iris originally comes from Holland, now living in the UK. And Denise comes from Belgium, now living in Queensland, Australia, just like me. I am so excited to have met two Nederlands (Dutch) speaking artists in the online art community. I met Iris through this artsy blog hop and I met Denise last year participating in Art Every Day Month. Iris is a mixed media artist who creates very cute whimsical girls. 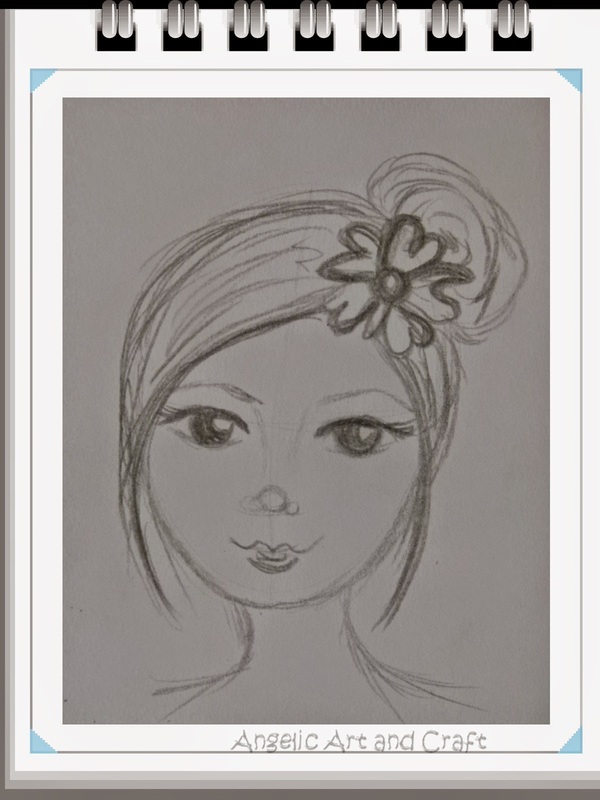 She has recently created a free 20 page inspirational guide and is now regularly posting little videos, in which she shows the creative process as mentioned in her guide. 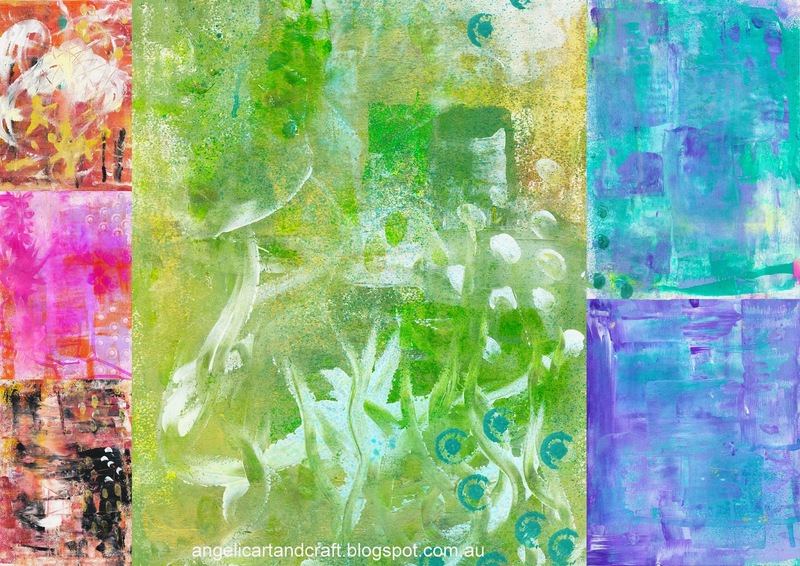 Denise creates stunning colourful art which is vibrant and happy. Her paintings feature geometrical shapes inter-weaved with images of humans and birds mainly. She also loves poetry, which she often combines with her pieces of art. Both artists absolutely live and breathe creating art and spend every spare time they can find, creating at their art table. 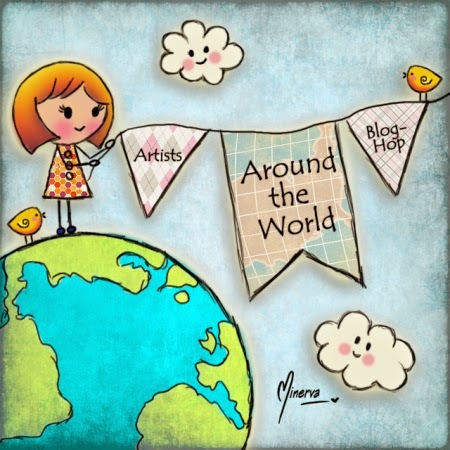 Please take your time to go and visit the blogs of these creative souls, and read what inspires them to create and the processes they go through, all explained in their post: Around the world Artsy blog hop. To visit Iris click here. To visit Denise click here. 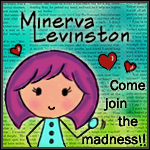 To visit Minerva click here. My name is Angelique. 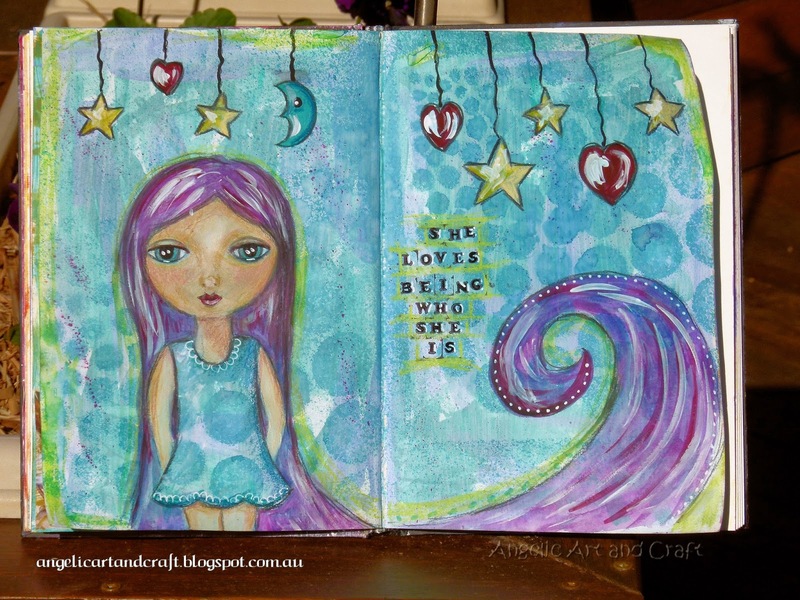 I love pretty papers, paints, pencils, stamps, ink, drawing, books and gorgeous colours and embellishments. Join me on my creative journey.